Introduce a drop of colour to your wardrobe with this stunning piece by Beige Label. 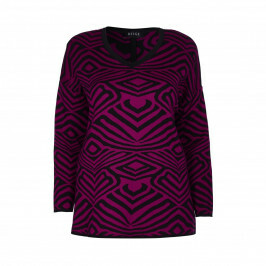 Striking in Magenta, the poncho comes complete with ribbed sleeves in a black colour base. Open wearing with a beautiful abstract pattern, this poncho is just the thing to complete your look in style. 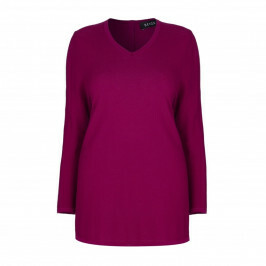 Ideal for wearing with a jersey trouser, short sleeved top or vest. Add a pair of boots for that stylish finish. Black and magenta knitted poncho. 50% Cotton, 50% Acrylic. Delicate Machine Wash or Dry Clean.